You can manage records in your organization even if you don’t have a Records Center site. If your company has separate document storage areas—by division for example—where all important documents are kept, then it’s not always advantageous to store records in any one centralized repository. Instead, you may want to update documents and store records all in one collaborative environment. Declaring items as records “in place” enables you to work with your records and documents in any list or library, on any SharePoint site. Note: The information in this article assumes that you have already configured in place records management at the site collection level. With the proper permissions, you can declare most list or library items as records. This enables you to use all of records management features on any item in most lists or libraries and on any site. Note: You must have at least Contribute permissions to declare items as records. Navigate to the site and list or library that contains the item(s) that you want to declare as a record. Depending on whether you are working with a list or library, click the Items tab or the Documents tab on the Ribbon. Move your cursor to the left of the item that you want to declare as a record, and select the checkbox that appears. 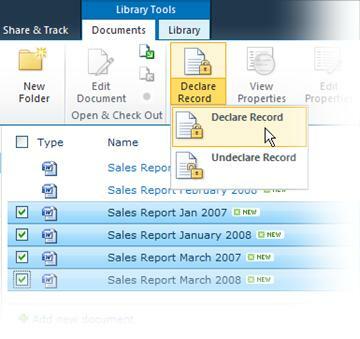 Tip: To declare several items as records simultaneously, select the check boxes next to multiple items. Select Declare Record on the ribbon. Items that have been declared as records are identified with a padlock symbol . Navigate to the site and list or library that contains the item(s) that you want to undeclare as a record. Move your cursor to the right of the item that you want to undeclare as a record, select the downward arrow that appears and then select Compliance Details. Next to Record Status, click Undeclare Record. You are prompted to confirm that you want to undeclare the item as a record. Note: The Undeclare option only appears for items previously declared as records. Note: The padlock symbol is removed from undeclared records.